These little ghouls are so easy to make your kids will be howling for more. Make a big batch of dough and put together as many ghouls as you can handle. These make great window sill decorations! Please note that this recipe is enough to make lots and lots of ghosts. If you only plan on making a few, cut the recipe down, or use the remainder to make some of our other salt dough creations. See How to Make Salt Dough Pumpkins for more ideas. Preheat oven to 250 F. Mix together, salt, flour, and water until a dough is formed. Knead the dough on a floured surface until the mixture is elastic and smooth. If dough is too sticky, sprinkle with flour, continue to do so until stickiness is gone. BE CAREFUL. Do not add too much flour, this will dry out the dough and will cause it to crack before you get a chance to bake it. THIS DOUGH IS NOT EDIBLE, though it won’t hurt you or your kids, it just won’t taste very good! Roll dough in your hands, then roll out a short and fat tube, like a snake. Stand up tube on cookie sheet and form a ghost with your fingers, making the head portion smaller than the rest of the body. Use the tip of your finger to create the waves at the bottom of the ghost. To do this, point your finger straight down on the cookie sheet and gently tap into the salt dough to make dents. 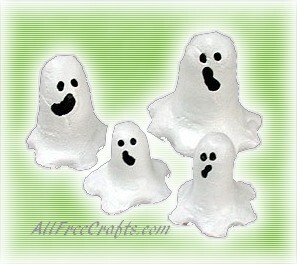 Make different sized ghosts, some large for the adults and some small for the children. Use a toothpick to poke eye holes BEFORE placing in the oven. Bake for approximately 2 – 2.5 hours. Check the bottom of your ghosts for wet spots, if wet, continue cooking in 20 minute increments until dry. Remove from oven and allow to cool completely. For best results, allow to cool and dry overnight, or for at least 4 hours. Paint ghosts with white paint. Repeat if needed. Use a toothpick dipped in black paint to add the eyes. Use black marker to draw on mouths, then fill in with black paint using a paint brush. Optional Step: You may choose to embellish your ghost family by fashioning bow ties out of scrap pieces of felt and adding a few buttons to the front of them with colorful paint. Let dry completely and spray with acrylic sealer. Amanda Formaro is the entrepreneurial mother of four children. She is also the Chief Editor and Craft Expert of FamilyCorner.com Magazine.